Based on reviews from 21 experts and 10,172 users. 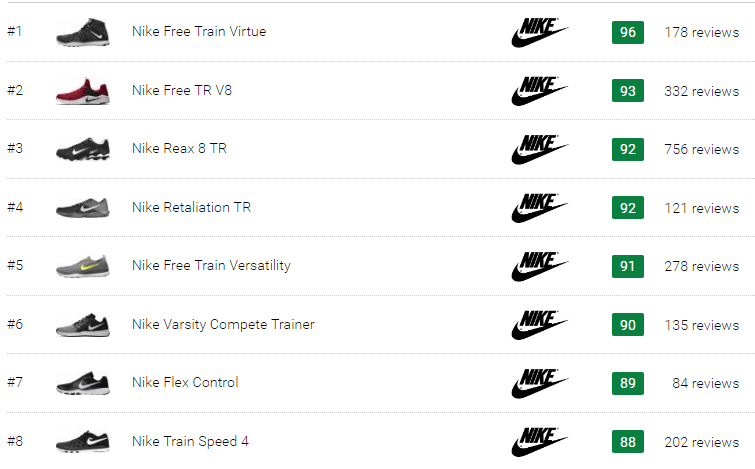 Learn how our rankings work or see our guide to Nike workout shoes. Updated Apr 2019. That’s why they are constructed to be lightweight and flexible, render lateral stability, have a low-profile midsole, and employ a grippy outsole. Even though all workout trainers from Nike are created for the same purpose and share similar characteristics, they still differ in the kind of technologies and materials used. This section aims to clarify the differences and help you figure out which shoe would match your training needs. The layer of padding between your foot and the ground has a considerable influence on your training experience. Its density, responsiveness, weight, and flexibility must resonate with your specific needs and preferences. Nike workout shoes have gone through several decades of transformation and are now offered in a range of different cushioning systems. Each of them is explained in the sections below. This technology is comprised of resilient PU (polyurethane) capsules filled with special inert gas. Depending on the model, these capsules are located under the heel or the forefoot or make up a full-length unit. Such Air Soles help in reducing the weight of the shoe while still providing a durable and responsive cushioning. The airbags compress upon impact but quickly return to their original shape, ready for the next step. The Air Max unit is based on the same principle as the original Air. It still features sturdy gas-filled PU bags but increases their volume in place of heavier midsole materials. Instead of covering separate parts of a shoe, it forms a full-length cushioning unit. This alteration makes the shoe sole even more lightweight but still abrasion-resistant and capable of attenuating shock from repetitive landings. Another novelty of the Air Max is that the air pocket has become visible in the heel section. This eye-catching update adds a stylish and futuristic touch to a pair of Nike workout shoes. The Nike Zoom cushioning belongs to the Air family and inherits its predecessors’ tough airbags. It is still designed to be lightweight and durable but its air units have been made significantly thinner. The manufacturer has also placed tightly stretched fibers inside the Zoom air capsules. These fibers squeeze and bounce back immediately to ensure a responsive ride. Such construction delivers a closer-to-the-ground underfoot experience which provides enhanced surface contact and maneuverability. That’s why this technology is so widely used in Nike basketball shoes. Plenty of Nike workout shoes also benefit from the way Zoom allows to make quick multi-directional movements and doesn’t weigh the foot down. The low-to-the-ground positioning also contributes to the platform stability. First introduced in 2004, the Nike Free technology fuses the midsole and the outsole into a single lightweight and highly flexible unit. It features deeply segmented flex grooves which were designed based on a few years of studying the way athletes train barefoot. Nike workout shoes with the Free sole have minimal cushioning and induce the muscles of the foot to perform in a more natural way. This type of shoes is popular among minimalist training aficionados who want to receive the benefits of barefoot training while keeping their feet protected from the hazards. Inspired by the bouncy walk of astronauts in space, Nike designers wanted to recreate this motion in a plush yet responsive shoe midsole. As a result, the Lunarlon saw the world in 2005, featuring a soft yet bouncy foam encapsulated inside a firmer, supportive Phylon foam. Nike workout shoes with the Lunarlon are 30% more lightweight than the ones with a Phylon of EVA foam. This compound also distributes the impact more evenly throughout the platform, protecting the foot and lower extremities from excessive shock. Nike workout shoes can be roughly divided into two categories: those with rubber lining and the Nike Free soles. The bottom of most Nike workout shoes is lined with durable rubber. Its grippy nature ensures that the platform receives traction on gym floors. The rubber is claimed to be non-marking which means that it doesn’t scuff or mark polished surfaces. Some of the models also feature a pivot point on the ball of the foot. It accommodates quick twists and turns on indoor surfaces. These Nike workouts shoes employ various patterns of flex grooves, using both vertical and horizontal ones. They are strategically placed throughout the outsole to allow natural foot bending. The midsole unit of these Nike workout shoes doubles as the outsole. Their bottom has deep triangular cuts which form the proprietary Tri-Star pattern. It allows the unit to expand in any direction, providing the foot with enhanced freedom of movement. The rubber pods are usually added in the forefoot and the heel sections of the Nike Free outsole. They help in keeping the platform safe from abrasion and contribute to its traction capability. Nike workout shoes are offered in a wide range of materials and different combinations of these materials. As a rule, one model uses multiple components to create a comfortable and functional foot coverage. Leather. It is the least pliable yet most supportive material which gives the foot a snug embrace. It usually has perforations to keep the insides aerated. Mesh. This fabric is more lightweight and breathable than leather and comes in a wide array of styles. It can be tightly-woven or have large ventilation pores. It also differs in thickness and softness. Finally, some mesh uppers are designed with the help of 3D printing for a more precise fit. But they all basically aim to give a sock-like foothold. Flyknit. So far, it is considered Nike’s most lightweight and form-fitting upper material. Its one-piece, seamless construction is meant to create the feeling of a second skin, as can be observed in the women’s Nike Air Zoom Fearless Flyknit 2. According to the brand, yarn and knit structures of the Flyknit are placed with careful precision, only where they are most needed to reduce excessive weight and bulk of the Nike workout shoes. Flywire. This patented technology, either embedded or visible, is found on nearly all Nike workout shoes. It is comprised of multiple thin yet robust Vectran fiber filaments that stretch from the outsole to the instep. They lock the foot securely in place, eliminating unwanted foot sliding during side-to-side movements. Being five times stronger than steel, the Flywire cables are barely noticeable on foot. PU overlays. Polyurethane overlays are often found on Nike workout shoes with mesh uppers. They protect the material on the toe box, at the heel, and around the eyelets where abrasion is most likely to occur. TPU side panels. A few trainers make use of lightweight yet sturdy thermoplastic polyurethane panels on the lateral and medial sides. They contribute to the foot stability as the wearer makes quick transitions throughout the workout. the fit of a workout shoe is defined by how well it accommodates your foot shape; depending on the last it was built on, the stretchability of their upper material, and the lacing system, trainers may feel snugger or looser on certain foot shapes; people with broader foot dimensions may need to opt for Wide or Extra Wide workout shoes. The majority of Nike workout shoes are offered within the range of $80 to $120 per pair. These trainers feature the brand’s acclaimed technologies and generally prove themselves to be well-crafted, comfortable, supportive, and long-lasting. But keep in mind, that a few months after their release, Nike workout shoes can be found at a discounted price in many online retail shops. Here at RunRepeat we keep an eye on the sales from more than 200 retailers to help you find the best shoe at the best price. Just click on the model that interests you and check out the list of discounted prices. The leading sportswear manufacturers have always kept their ear to the ground in order to keep up with the newest trends in training and fitness regimens. In the 1980s, Nike became the first brand to address the rapidly growing popularity of aerobic classes, full-body workouts, and cross-training. The idea of creating one pair of Nike workout shoes which would combine the functionality of several trainers belongs to Tinker Hatfield, a Nike footwear designer and a former architect. He noticed that athletes at the time had to carry up to five pairs of shoes to accommodate their sessions in aerobics, basketball, racquet sports, weightlifting, and jogging. Another problem was that some people used running shoes for the activities they were never intended for, risking to have pain and injuries. In 1987, the company introduced the first pair of Nike workout shoes, the Air Trainer 1. Designed by Hatfield, it was ready to serve as an all-in-one trainer for playing, running, and lifting weights. It also featured the brand’s renowned Air Sole cushioning unit. The shoe was enthusiastically acclaimed by tennis star John McEnroe, baseball and American football player Bo Jackson, among many other sports celebrities. In 2018, Nike released an update to pay tribute to the retro version while offering the best of its performance, the Nike Air Max Trainer 1. Ever since the success of the original Air Trainer 1 in the late 1980s, the company continued to experiment with designs and technologies to provide athletes with the best possible training footwear. Today, you can benefit from a wide choice of Nike workout shoes for various tastes and demands. Can I run in Nike workout shoes? Typically, workout shoes from Nike are made with the same cushioning technologies as their running shoes. That’s why they can be used for jogging and short-distance running. However, they are not recommended as dedicated running shoes because they are constructed for a different type of movement. Nike workout shoes typically have firmer and more low-profile midsoles than running shoes to help the foot stay stable during multi-directional movements and weight training. That’s why its cushioning is not meant to withstand the constant impact of heel striking. Can I do CrossFit in Nike workout shoes? If your main workout regimen is CrossFit, we recommend that you take a look at the dedicated CrossFit shoes from Nike or other brands. Regular Nike workout shoes are not designed with sufficient sole stability for weightlifting or protection for rope climbs. 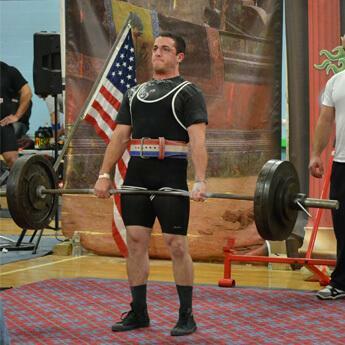 They are also not meant for serious weightlifting sessions; so, a shoe like Nike Romaleos 3 or analogous weightlifting trainers will be a better option for squats, snatches, and other lifting exercises. Do Nike workout shoes come with a warranty? As one of the leading sportswear companies, Nike guarantees the quality of its products. However, in an undesirable case of material or workmanship flaw, they recommend directly contacting the place where the pair was purchased. Also, check the label or the warranty card on your specific pair of Nike workout shoes to find the guidelines for return. How to take care of Nike workout shoes? Clean the shoes as soon as they get exposed to dirt; use a soft-bristled brush first. Prepare a mixture of warm water and a handful of laundry detergent; apply it to the trainer with the help of a soft brush, a piece of cloth, or a sponge. Use another brush, cloth, or sponge to remove the excess detergent with warm water. Let the shoes get dry naturally at room temperature. If the trainer has a removable insole, take it out and wash it the same way; let it dry completely before putting it back. Do NOT use a washing machine or a dryer to wash your Nike workout shoes as they can easily damage the components which hold parts of the footwear together.